1903: Coach Bummy Booth says rule changes wont have a long-term effect on the style of the game. 1918: During World War I, U.S. Sen. Gilbert Hitchcock, D-Neb., asks the War Department to rule on whether intercollegiate football will be permitted on campuses with Student Army Training Corps programs. 1938: Coach Biff Jones says he'll have to rely heavily on sophomores during the upcoming season. 1943: Coach Adolph J. Lewandowski says two promising freshmen are likely to be drafted into military service. 1963: Nebraska is picked to finish second in the Big Eight behind Oklahoma. 1968: Paul Rogers' 51-yard field goal in the final half-minute lifts Nebraska to a 13-10 win over Wyoming. During the game, Ernie Sigler replaces Frank Patrick at quarterback, a job he would keep for the rest of the season. 1973: Tom Osborne's career as head coach begins with an exclamation point: Nebraska 40, UCLA 13. 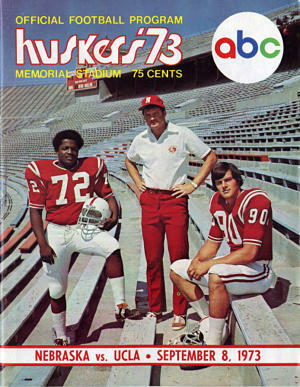 1978: The Huskers struggle to beat Cal, 36-26. Nebraska didn't get its first lead until early in the fourth quarter. 1988: Troy Aikman and UCLA drub the Huskers, 41-28, after stunning Nebraska with a 28-0 first quarter. 1993: The Huskers defeat Texas Tech, 50-27, in a game Nebraska didn't put away until late in the third quarter. 1998: Third-string QB Monte Christo is pressed into service as the Huskers defeat Cal, 24-3, on the road. 2003: David Dyches kicks four field goals as the Huskers turn away Penn State, 18-10, in what turned out to be PSU coach Joe Paterno's last game at Memorial Stadium. 2008: The Huskers improve to 3-0 with a 38-7 win over New Mexico State. 2013: After jumping to a 21-3 lead, Nebraska has no answers in the final 2½ quarters as UCLA rolls to a 41-21 win in Lincoln.